The exercise was to creat an interactive communication System for museums. We had the vision to create a quadcopter Simulation which is controllable through gestures. So we used the Leap Motion for controlling our interface. In this Simulation you are able to explore the components of the quadcopter like the motor and the board with the chips on it. Besides you can fly the quadcopter through gestures with your hand e.g. spread the fingers, roll your hand or make a fist. The Simulation is completely build with web technologies and the quadcopter and its components are build in Cinema4D. Quadrocopters are often present in the media, but most people don't know how they work. Our target group is mainly 14-20 year old teenagers and young adults. But older people should also have fun with our exhibition. It was important to us to use an intuitive modern control principle for our project. The controls should be fun and invite you to explore. In addition, we wanted to implement our project completely with web technologies so that it could be accessed in any browser. As technology we used the Leap Motion. The Leap Motion can determine the position and angle of the hand and measure how many fingers are visible. 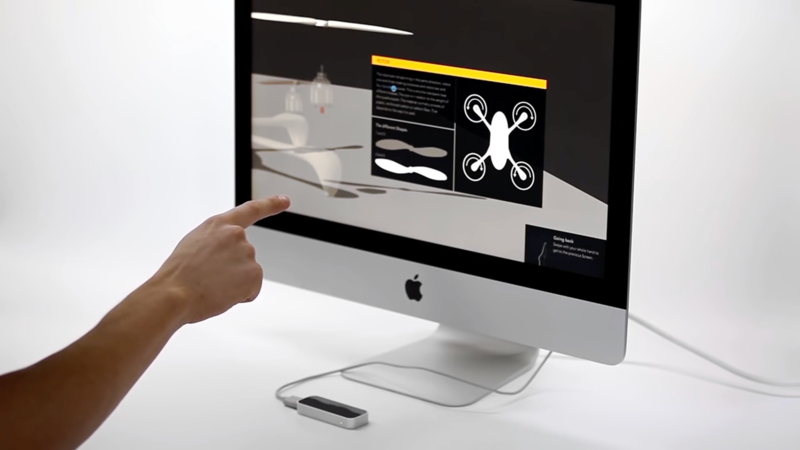 In exploration mode, you stretch out your index finger and use it to control a round "pointer" with which you can select individual objects of the quadrocopter. In flight mode you stretch out your hand with spread fingers and the quadrocopter takes over the movements of your hand. So you can fly the Quadrocopter intuitively. For the tutorial we filmed all gestures and got a transparent hand by post-processing, of which we only see the contour. Thus the tutorial is not disturbing but nevertheless visible with a light animation in the interface.